Miniature human blood vessel organoids could be used for developing new diabetes treatment. Organoids are 3D-models that are miniaturizing the world of anatomical research. Grown from stem cells, organoids mimic the cellular and anatomical make up of an organ and have been used to gain a greater understanding of the development and function of the body. 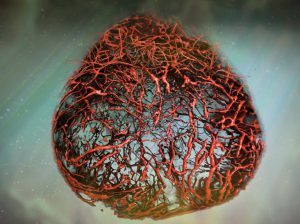 Adding to the list of organs that have been replicated, researchers from the University of British Columbia (BC, Canada) have developed vascular organoids, 3D human blood vessels that, when transplanted into mice, can develop into a fully functioning human vascular system that includes arteries and capillaries. "Being able to build human blood vessels as organoids from stem cells is a game changer," commented senior author Josef Penninger. Despite affecting an estimated 420 million people worldwide, little is known about the vascular changes that occur due to diabetes. In trying to learn more, the researchers exposed their organoids into a ‘diabetic’ environment. A key feature of diabetes is the thickening of the vessel’s basement membrane, a feature mimicked by the organoids. Following this observation, the team searched for compounds that could help in blocking the thickening process having found that no currently used anti-diabetic medication had an effect. They observed that inhibiting the γ-secretase enzyme prevented the thickening, potentially identifying a new target for diabetic treatment. These results, published recently in Nature, show a great advance in research into the vascular system and have the potential to be used as a method of finding novel treatments for diabetes and other cardiovascular diseases.